Invitation to the holiday tree lighting being held at York River East on November 29. 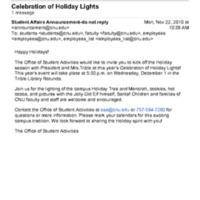 Email invitation to the Holiday tree lighting on December 2, 2009 in the Trible Library. 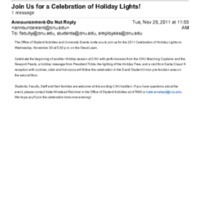 Email invitation to the holiday tree and menorah lighting on Decmeber 1, 2010. An email invitation to the holiday tree lighting to be held on November 30, 2011.